Hay Budden Blackjack price per pound? Hey, so I posted a few years back asking about an anvil that I got at an auction. Since then I've decided to move overseas and won't be taking it with me, so I'm hoping to sell it. First I need a decent ballpark of what it's worth though, which is where I'd love some help if possible. It's a J.E. Pilcher Solid Wrought Blackjack brand, 311 marked (pretty sure that's 311 lbs since it's USA made) and the serial of 47043 puts it at between 1898 and 1899 for being made. I have the original pictures from the first post, and other than a little discoloration on top it's still in the same condition. Well anvils tend to be cheaper in England----that's where you are at Right? Or is it South Africa? Australia? Which of the 100+ countries that participate here are you in? 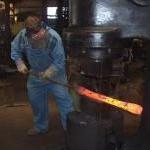 Shoot just here in the USA anvil prices can vary by several hundred dollars just depending on which state you are in! What did you pay for it in 2015? be a good starting point in figuring out price per pound where you are located. Last year I bought a 106 pound Hay Budden for $1.89 U.S. per pound. Sorry, I forgot to mention that! I'm in East Texas. As for how much I paid, it was covered in paint and at a farm auction. I paid $600 for it then. Prices have gone crazy, but I've always felt there are two markets for anvils really. The first is the crazy collector/newbie market like Ebay and Craigslist where $6 per pound or more seems to be the norm. I've seen some crazy high prices on sub-quality anvils. Guys like you could cash in by going there if you want to. The second market is the blacksmith market. These are guys that see an anvil as a great tool and intend to use it. Buyers here can walk away from stupid prices. Here I think $3-$4 per pound is reasonable with some old timers refusing to pay even that. I personally would choose the blacksmith market to sell it if it were me. I'd want to know it was going to someone who would appreciate and care for something I've appreciated and cared for over the years. At 311 pounds you paid about $1.92 per pound. Now you have yourself a dilemma. You could hit market one at $5 per pound and cash in on a big payday of over $1,500 more than doubling your original investment. Or, you could hit market two at $3.50 per pound and clear almost a $500 profit. Nobody can condemn you which way you go with it.